Tintype has been invented in 1853 by a French researcher - Adolphe Alexandre Martin (1824-1896) - who was looking for a solution to simplify the work of plate engravers. Martin started first to improve the Ambrotype photographic process but without significant success. One day, he decided to replace the glass plate used in the Ambrotype process with black enameled iron plate covered with collodion. The result that he got was a positive image which was then easy to engrave and print. Martin noticed in passing that the image was attractive to the eye but this was not the objective of his research so he did not realize the commercial potential of what he had discovered. In 1855, Hamilton Smith (1819-1903) a chemistry professor at Kenyon College in Gambier, Ohio (US) discovers Martin’s works and decides to reproduce the same experiment. One of his students - Peter Neff Jr - understands immediately the potential offered by this cheap process of images creation. Neff offers to his professor to organize the industrialization of this process in exchange of patent rights. Patent is issued in February 1856 under the designation of «Melainotype». Later on, another student of the Kenyon College - Victor Moreau Griswold - decides to compete with Neff in the production of enameled iron plate. He decides to name his product « Ferrotype ». Like Ambrotypes, the ferrotype plates are prepared with a sensitized collodion substance coated on thin metal plates. These plates are previously covered with a black enamel varnish. The obtained image is a direct positive one. The process was simple, fast, cheap, giving good results. Due to this, the Ferrotype was an outstanding success which continued to be used until the beginning of WW II in Europe. The Ferrotypes have been produced in different formats and presentations. In Europe, they were presented in decorated paper frames. In US, they were put in images cases similar to the ones used for Daguerreotypes or Ambrotypes. 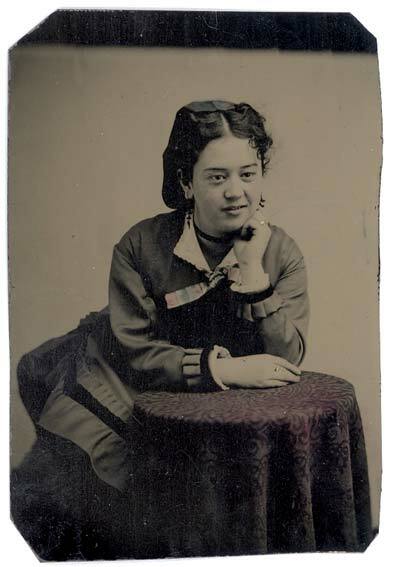 The invention of multi-lens cameras with revolving backs allowed the production of tiny "Gem" tintypes, sold by set of 16 and presented in CDV format. Like the other kinds of B&W images, ferrotypes also could be hand-tinted and even beautifully overpainted by skilled photographic artisans. Nevertheless, this type of picture can be damaged by scratching and abrasion. A beautiful tintype, perfectly preserved, is rare. (ndlr : My friend Paul has the most exceptional Ferrotype I ever see... The one of Mrs Cotton). United States, c.1862, gutta-percha case "Monitor"
M.. Babbitt (Father of Miss Matie A.Babbitt). Born in Delaware township, she get married with Charles E.Blodgett on January 5th 18?? at 11am. He get married with Miss Matie A.Babbutt on January 5th 18?? at 11am. An American family from Missouri. Unusual format of 12 x 18 cm. On the back of the "Monitor" gutta-percha case is written "I.N HODSON. 1840 Aug. 24".On checking, this gentleman was never listed onto the muster roll of the famous Yankee battleship named the "Monitor". Father of Lucy Alice Howarth Chace Scovil. Tiny size of tintype produced only during the 1860s. The portrait is enclosed in its own embossed brass preserver, and each measures only 2.5 cm tall by 2 cm wide. Three small portrais of the same young woman.